Discussion in 'Handloads for all Sako models' started by maximus otter, Mar 20, 2018. The temperature was 32°F; the wind was gusting at up to 15-20 mph. (The two diamonds to the right were fired under poor conditions using cartridges with a random selection of powder charges and seating depths). 25.9 grains of Vihtavuori N133 powder (Max. recommended load in the manual). Using my MagnetoSpeed V3 an admittedly small number of rounds fired gave me an average of 3,524 fps and an SD of 15.6. (Note: The previous owner shortened the barrel to about 20"). An overall average of about 0.33 MOA looks very promising at this stage. I look forward to refining the load further. That is fantastic grouping, particularly under those conditions. Remember, the pursuit of perfection is the enemy of the enjoyment of excellence. Maybe you should stop with your load development right where you are! "Doin' right ain't got no end..."
I continued my load development, but encountered problem after problem. The one I detail above using the 40-grain V-Max proved to be disappointingly inconsistent; besides, 40-grain bullets are illegal for the two small species of invasive deer I stalk near my home. 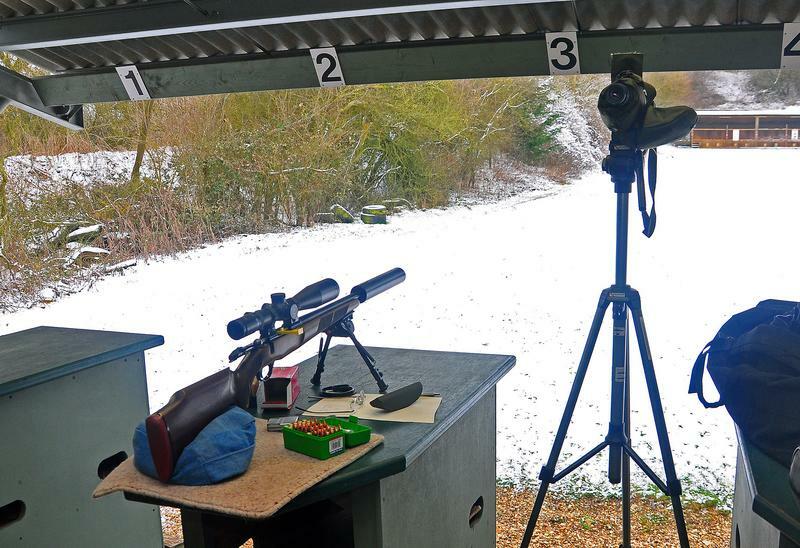 English law requires at least a 50-grain bullet, either JHP or JSP, for muntjac and Chinese water deer. After several months and at least £150 in components, frankly I was more than fed up. I was seriously considering selling or re-barreling the rifle. Then, a very simple idea occurred to me: Try it with the moderator off. The result? Groups immediately tightened from about 1.02" to 0.4"! 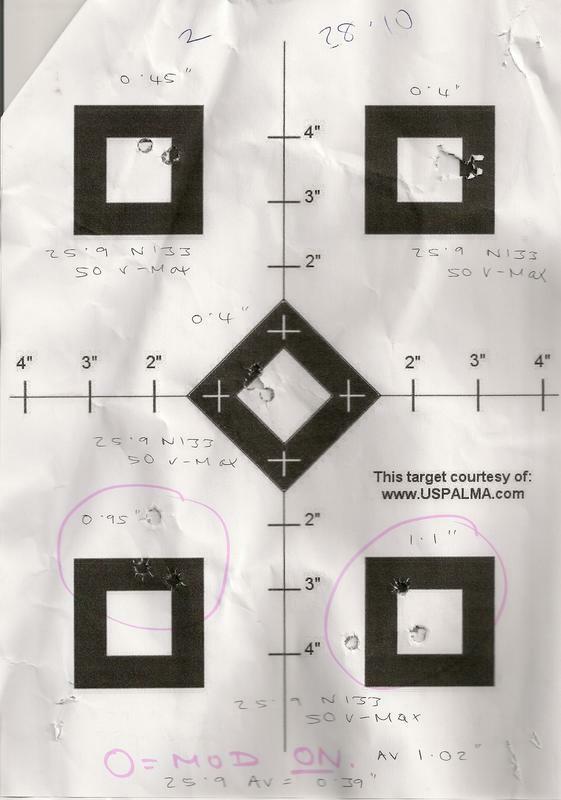 Average of all four 3-round groups (including the flier from the cold bore shot in Group 1) was 0.244 MOA. If I cheat and exclude Group 1, the average is 0.19 MOA! 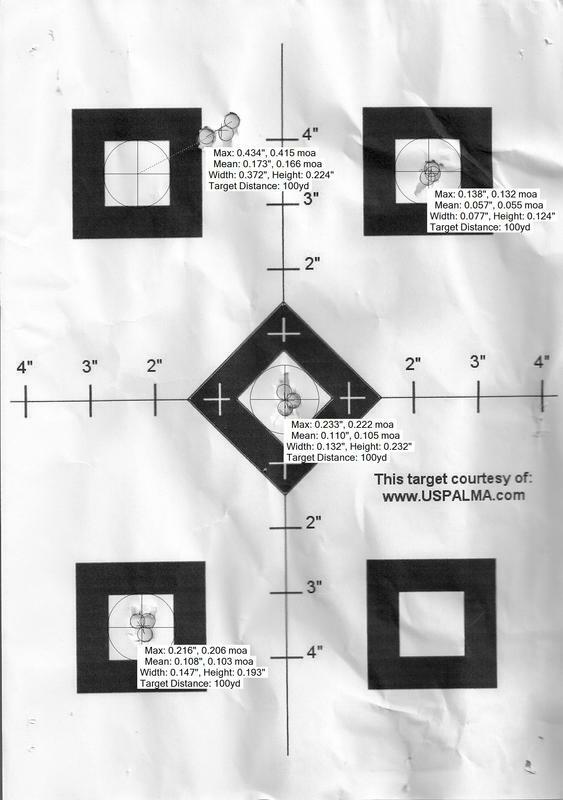 Average muzzle velocity will be in the order of 3,465 fps. I have consigned the errant Wildcat Evo 8 moderator to a mate of mine who has a lathe. He's going to check it for concentricity, then probably ream the holes out to 7mm or even 8mm. I'm happy to lose a couple of dB in noise reduction to regain accuracy.